Kennedy-Lugar Youth Exchange & Study (YES) alumnus, Kulthoom Al Khamiyasi (Koola) and his colleague Hassan Al Busaidi, are working to address the youth unemployment issue in Oman. Koola and Hasan identified one of the main difficulties facing Omani youth seeking employment is the lack of relevant work experience and the absence of a platform to provide information on job opportunities. Together, they launched the Jisser Student Internship Platform, an online platform that matches trainees with donors offering business training and job opportunities, to help students and recent graduates receive the training they need. Through the Jisser website, registered donor businesses post training opportunities that trainees can research and apply for based on their training needs. In addition to the Jisser platform, Koola and Hassan created a component in which volunteers are recruited to coach and set up workshops for students and recent graduates to sharpen their professional skills, such as time management and how to conduct a proper interview. 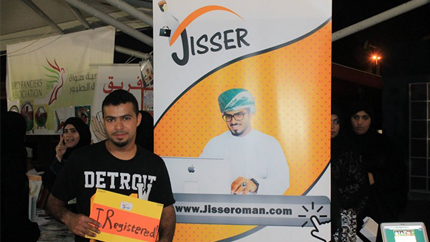 Since its launch in 2013, Jisser has grown to a base of 90 companies with 4,000 students registered and has won the “Best Visual Presentation” award from the United Arab Emirates Youth initiative Award. It has also won Fourth Prize in Oman’s Al Roya Youth Initiative Awards. Besides their work supporting youth through the Jisser project, Koola and Hasan dedicate their spare time to participating in voluntary activities in their communities and developing sustainable charity projects.